1 Providing equipment for the care and lifestyle specifically for teenagers with cancer. 2 Supporting the development of a Teenage Cancer Unit, through the Teenage Cancer Trust. 3 To provide help and support to teenagers with cancer and their families to relieve the stress and hardship during a difficult time. We are part of a group of 50 riders, all on 50cc mopeds which will be setting of from John O’Groats on Saturday 7th April and will hopefully be at Lands End on Friday 13th April. As we are riding mopeds our top speed will be 30 mph, so we are using smaller roads and plan to ride around 150 – 170 miles a day passing through some very scenic but also very hilly countryside. Including stops we estimate 8 hours riding per day. There will be a total of 55 riders all on 50 cc mopeds ranging from classic to modern. Start from Worksop Rugby Club at 8.00am ride 138.8 miles and arrive at Tunnel House Campsite (http://www.tunnelhouse.com/) at approximately 5.21pm - this allows for a 2 hours stop at Queens Medical Centre Nottingham. (Brads Cancer Ward). Start from Fox & Hounds Campsite at 8.00am ride 95.9 miles and arrive at LAND'S END (yaaay!) at approximately 1.00pm - includes 30 minute stop at petrol station 2 miles from LE for everyone to get together so we can arrive at LE together. We will then be having a finishing party / Classic VW show - The whole run was all organised by and on Volks Zone International which is an online forum for VW enthusiasts. 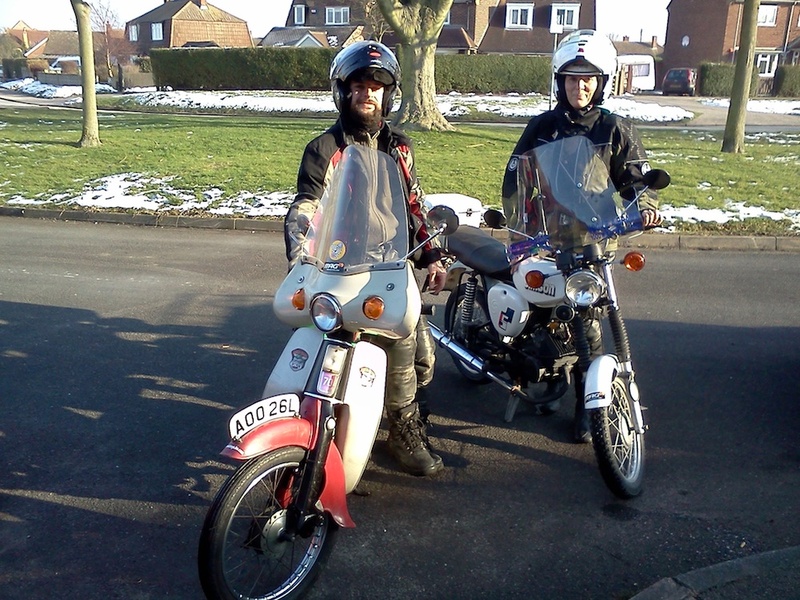 This entry was posted in Blog and tagged Honda C50, Teenage Cancer Trust. Bookmark the permalink.